Doing my eBay inventory helped me weed out a lot of clothes that I bought when my business was new in 2006 and 2007. Basically, I was inexperienced and thought any piece of clothing with “Gap” or “Gymboree” on the tag could be sold on eBay. Boy was I wrong. I got rid of 93 items, most of them from my eBay business that shouldn’t have been bought in the first place. I have now gotten rid of 1016 items through the decluttering challenge. We are definitely noticing an improvement and more room in our apartment, but we still have a lot to get rid of. How are you doing? Have you been decluttering? If so, feel free to link up. GREAT job on the decluttering! I’m only on 171 items, but after this weekend I hope to add another 200. Decluttering is no. 1 priority over the next couple of weeks. We won’t get to the garage until the kid’s spring break, and I’m sure that will add at least 500 items. Ugh. How do we collect so much? That is what I am always wondering. I am definitely trying to be more careful about what I bring into the house now, because this very long decluttering process is NO fun (although I am loving the results)! Since we live in a 2 bedroom apartment with 3 kids, we have no room to store the junk. My mom is generously letting us fill her basement for now. We will have the garage sale at her house this May or June. 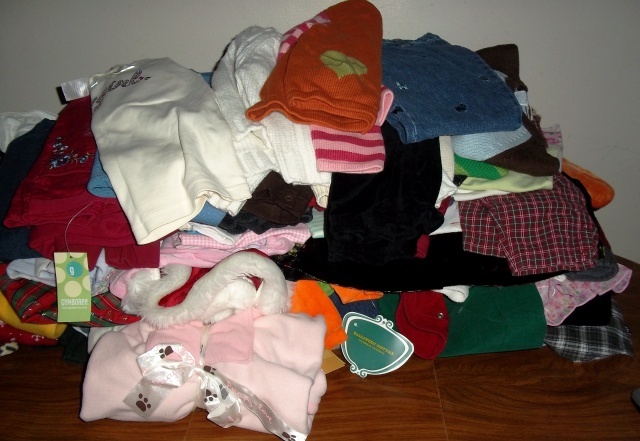 As we have a ton of baby/kid items to get rid of, I do think we will make enough to make it worth our while, but we wouldn’t be able to do it if my mom hadn’t agreed to generously let us store the stuff there. Whatever doesn’t sell at the garage sale is going to Goodwill because I really want to be free of this stuff!